While handling the Nokia X phones we installed a couple of benchmarks from Nokia's app store and it dawned on us that it will be interesting to find out just how rich the app store is on what is basically Day 1. We opened Google Play Store on one of our standard Android phones and checked the Editor's Choice and Top Free sections, then we searched for those apps on the Nokia's. What we found is that the X phones use an interesting setup – there's Nokia's app store, but there are several others preinstalled too. If an app isn't available in Nokia's store, but is available in one of the others, it will show up in the search results. Just tap on it and the other app store will launch and repeat the search. We spotted 4-5 different app stores in our searches. Apps marked with a * are from other app stores. As you can see the list of missing apps is longer, but those are mostly games, the only app we really miss is Nova Launcher (though you probably might be able to sideload that directly). At least the apps that are there cover the basic social networking apps (Facebook and Twitter) and the popular chat apps (WhatsApp, Skype, Line, even Telegram). Popular keyboard replacements SwiftKey and Swype are also available. 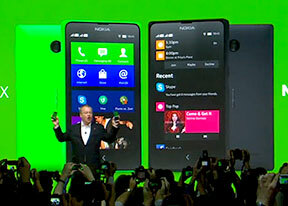 And what's this – the Nokia X (X+ and XL too) will have Instagram on Day 1! We are, of course, alluding to how much effort Nokia put into bringing Instagram to Windows Phone (remember all those #2InstaWithLove updates?). Using Android has advantages after all, huh? More importantly, this seemingly confirms Nokia's claim that most apps are compatible with its brand of Android (the missing apps may be missing because they are not uploaded to the alternative app stores, not that they're incompatible). By the way, Nokia has a cool site to help developers test if their app is compatible with Nokia X – it's literally just drag and drop.